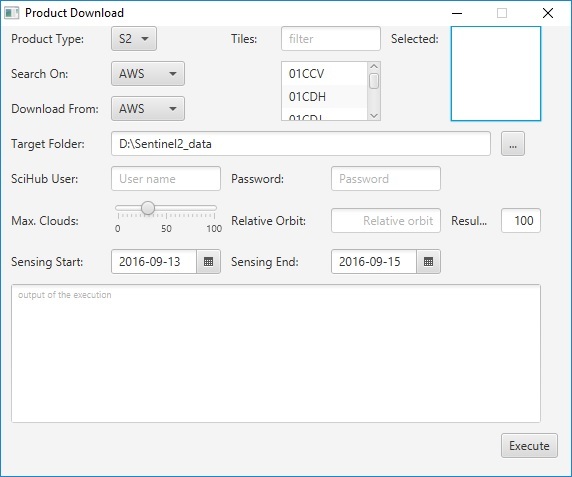 There are a variety of ways to download Sentinel 2 data, for example here, here or here. One of the easiest ways, and it seems to at least to me the fastest, is through AWS. You can go straight to the bucket, or search and explore for data through one of the eight recommended featured uses. Sentinel 2 data acquired from 28th March 2017 onwards has been processed as level 2a products (bottom of the atmosphere), made available for Europe from the Sci Hub. These products have been processed using Sen2Cor. Previously you needed Python 2.7 and Anaconda to run Sen2Cor but in its latest version there is a stand alone 64bit Windows/Linux/Mac installer. I believe a future version will be included in SNAP desktop (it is being tested in SNAP 6 Beta). How do I get level 2a products from older data or data from outside Europe when it has been downloaded from AWS? This was the question I ran into recently. If you download straight from the AWS bucket you will not have all the .safe and .xml data associated files to run Sen2Cor. Therefore you are faced with a choice. Or are you? 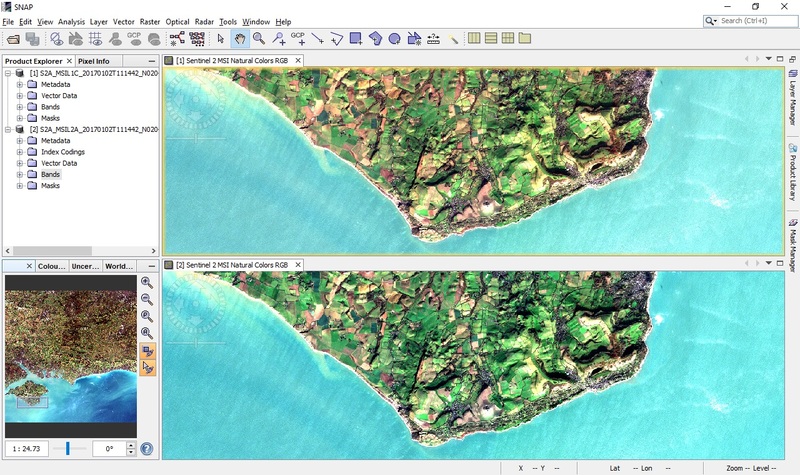 Cosmin Cara has built a very nifty tool that will download the Sentinel 2 tiles for you and save them in a format that is compatible with Sen2Cor. It has several nice features, allowing you to search on Scihub or AWS and download from either; as long as you know the tile you need you are good to go. Once you have run Sen2Cor, both Level 1C (available on AWS) and Level 2A can be viewed in SNAP (Level2A is the bottom image). Both have a 95% stretch applied. It is difficult to see much difference between the two images, however once you have atmospherically corrected the data you are good to go and perform whatever analysis is needed. We are moving more towards an Analysis Ready Data (ARD) world, perhaps where corrections like these will already be done for us. Analysis Ready Data seems to be one of the trends of 2017. 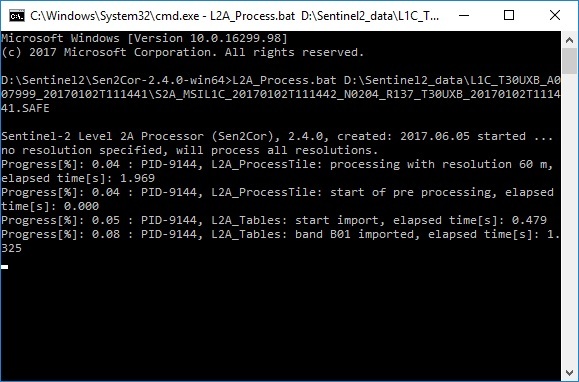 Work is being/has been done on making both Landsat and Sentinel 2 analysis ready. It seems that this is another edge of Earth Observation data, namely the deluge of data needs to be analysed in a consistent way, so we can become truly sensor agnostic for our analysis – which is in part what Descartes Labs appear to be aiming at. This entry was tagged AWS, Earth Observation, Sen2Cor, Sentinel2. Bookmark the permalink.